Has anyone experience galvanic corrosion with the use of alloy press-fit BB cups inserted into a carbon BB shell? I've read when installing press-fit cups into a carbon shell (the kind without the metal sleeve) one should do so "dry." 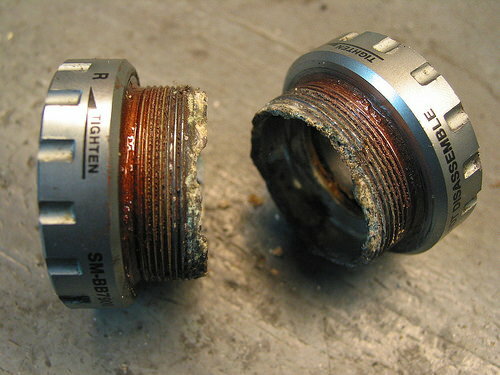 If this is true, it seems that galvanic corrosion could be an issue? How would you suggest installing alloy cups into a carbon BB shell to avoid galvanic corrosion? I've heard grease is not a good idea since it may soften carbon. Time is a huge factor to take into consideration. However, with press-fit BB cups I would assume one would not want to remove them until it was necessary, i.e. the bearings need to be replaced. In some cases, at least for me, that could be many years. Also, with Campagnolo Ultra Torque, there is no reason to ever remove the cups considering the bearings are not in the cups themselves, rather they are located on the spindles. Having said that, if one does remove a press-fit BB cup, is it a good idea to reuse it even if there is no obvious distortion of the cups? According to Boeing (aircraft), carbon fiber and aluminum can, under the right conditions, create galvanic corrosion. I would think that clear coat, paint, anodization, and lubrication would tend to insulate the bare fibers from the raw aluminum. I cannot see your project..
have you already taken that apart and found that to be true? a stack of alternating Zinc and Carbon is what makes up the old dry cell batteries. can you see an issue with that..? an insulating layer of glass fiber between them may be sufficient ? but you are not building a carbon fiber frame..
Last edited by fietsbob; 04-28-18 at 12:31 PM. When new this is true. But with time, wear, aggressive sweat, road salt and neglect, no. Note two are specific to what I already mentioned. For metal to metal contacts, using copper mounting paste prevents the galvanic corrosion. Not sure how it works with carbon (I would guess the frame has some sort of metal interface built in for bearings though). ...as others have noted, I have personally never seen a carbon fiber reinforced plastic BB shell that did not have a metal insert. I can see where it might be possible with a press fit setup, but I'd be curious about how to make something like that work in terms of molding/machining. Corrosion on threading like BB's is a real problem, but with press in bearings, it would seem to me that the force needed to remove and reinstall them using puller and press would overcome that. Corrosion would also still damage the interface. I'd rather prevent it. I have personally never seen a carbon fiber reinforced plastic BB shell that did not have a metal insert. My Colnago carbon frame does not have a metal insert in the BB shell. It is pure, 100%, made in Taiwan carbon. The largest LBS brand in the world, Trek, hasn't used a metal insert in their high performance carbon frames for a number of years. While working in a Trek selling LBS I have also seen many other brands not having a sleeve. I totally agree about the challenges of molding/manufacturing a carbon only shell with the fairly narrow tolerances that press fit bearings require to run movement and noise free. The number of after market solutions for BB noises (with pressed in bearings) might suggest this to those who ponder or have to answer to their customers. But what I don't see with BBs is any corrosion issue, excepting the handful of extreme situations that are not from normal use. Now seat posts, bottle bosses, frame joinings are different. In these areas I've seen a bunch of corrosion related problems. I don't know if copper paste would do anything to prevent galvanic corrosion on the aluminum parts since the copper is more noble. Aluminum paste would be better since the paste will break down first. Carbon frames with no metal insert generally are primed and painted, which is likely enough insulation for something with no threads. But I'm not familiar with any systems the press metal into carbon. PF30 uses nylon cups for a reason, and most metal replacements are held in with a threaded part. So I'm curious what system is being discussed. Have you had experience with copper paste? I ride all year long, including winter salty roads - copper paste works well in preventing the galvanic corrosion. It lasts for years and years on bolts that don't need regular unscrewing/service. Lots of things work - including simple grease. But if you are looking at the chemistry galvanic corrosion, steel, copper, titanium and carbon are all more noble than aluminum. Copper is preferred for higher temperature uses, but if you are concerned about aluminum cups it makes sense to use aluminum paste because it is as anodic as the aluminum. Even better would be magnesium paste would be even better as it would be truly sacrificial compared to aluminum, but that kind of paste is hard to find. Copper is neither an insulator nor an anode, but it is an excellent conductor. My experience differs. Greased bolts in aluminium things get stuck after a while, while "copper pasted" bolts don't. Of course, copper paste is good for high temperatures (as well). I've been using it for years on bikes and motor bikes. The paste I use is this one (link) - I'm not selling it, nor advertising, that's just the one that can be bought at a reasonable price locally and for which the tech data is available. The downsides are colour (it looks like rust, copper coloured) and it's hard(er) to wipe off. That is the reason why, in stead of explaining to customers that their bolts are not rusted, I've started using this paste (link) - it is kaolin and titanium oxide based, white colour, easy to wipe off wherever it's not needed. I still use copper paste on disc brake caliper bolts (and pad slides on motorcycle), because of the high(er) temperatures. The copper paste is noted to have a -30 to +1100 C temperature range, while the "white one" is for -30 to +200 C.
Both prevent galvanic corrosion between two steel parts, two aluminium parts, as well as steel and aluminium combination. That's been my experience for the past 10+ years at least. I'm sure a chemist worth their salt could provide an explanation on why it works better than ("ordinary") grease. EDIT: for full disclosure - haven't worked with the white paste for more than 3 years, the copper one I've been using for over 10 years and no problems so far. Tech experts from the company that sells the pastes have said that for the intended purposes (preventing bike bolts from galvanic corrosion on steel, alu and steel/alu combination) they should both work equally well. Have consulted one "independent" source before application (a Dr of metallurgical engineering, not a chemist) and they have confirmed the info and recommendations. Last edited by Bike Gremlin; 05-01-18 at 01:46 AM. Your experience of failing to have an issue with copper anti-seize does not prove that it is the best product, just as all the people who have had no problems using grease would also say their experience is that it works fine. As they explain in the article, when there is enough moisture to create galvanic conditions, copper doesn't help. Which is why I'm suggesting you switch to aluminum (gray) antiseize for aluminum parts. It is the common stuff you can get at any auto store, and is cheaper. For the article: I'm not a chemist, but in my experience (steel, alu and combo interfaces, haven't worked with alu-titanium combo that is talked about in the article), copper paste does a better job of preventing galvanic corrosion than "any non conductive grease". Grease, again, in my experience, needs to be re-applied at least annually, while copper paste stays and keeps preventing the corrosion for years of riding - throughout the whole year and lots of rain, salt etc. The article doesn't recommend aluminium "grease", but "non-conductive" grease. What would you recommend for aluminium-steel interfaces? I have no doubts that aluminium oxide based mounting paste might work perfectly well (can't see how it would work better, since even with copper there's been no noticeable galvanic corrosion), I'll look into that. The guy at Moots did say some of the guys there also like to use the silver colored anti-seize for extreme conditions. If you would prefer to use anti-seize, that is what I'm also recommend you use because of the superior galvanic properties to copper with aluminum and ti/carbon/steel. The whole article is geared towards "non-conductive" grease recommendation. This sentence is taken out of the context - looks like trolling to me. For the intended purposes, two separate local experts have recommended greases other than aluminum that you recommend, without any warnings that there are better options. I did make sure to stress that galvanic corrosion prevention in winter riding conditions is a major concern when asking and that the price is important only if there's a cheap(er) option that works (just as) well. It is also confirmed with my 1st hand experience. I do intend to look into ti-alu combination and aluminium based anti-seize. Geez, people sure like to throw out "troll" all of a sudden. The article is basically about how copper antiseize like Ti -prep doesn't do what we think it should, and that most Ti makers just recommend grease. You don't want to use grease and I don't think it is the best choice either, so I'm making a recommendation that is in line with what Moots recommends for "extreme conditions", which I can only assume means wet or salty. Just FYI, aluminum is sacrificial to copper. All metals are sacrificial to carbon. Heard from the local company that makes (good quality) greases I usually buy from (FAM). Sent an inquiry about Ti, alu and steel combos and asked for mounting paste recommendation. They had confirmed that copper grease is perfectly fine (which confirms with my previous experience) for all the combos, including titanium + aluminium. Of the two mounting pastes they make and that I've been using (Famol HT - copper, and Famol PT - titanium oxide+kaolin) they said both will work perfectly fine, no need to get anything else (they do make Alu mounting paste as well, and I asked if it would work any better and does it make sense to buy that too) in terms of galvanic corrosion prevention. They also said the main limiting factor is the temperature. As long as it doesn't exceed 200 C, no need to use the copper paste, I can stay with the cleaner looking white stuff I had switched to - unless brakes make too much heat (I stick with copper for brake bolts just in case). Pressures are not that high on bicycles, so that was not a limiting factor when making a choice. I really enjoyed the debate between Kontact and Slaninar. In the end it seems they retreated to their respective corners without converting either one. Big thank you to Kontact for the link to Black Mountain Cycles post (it provided more reasoned info then any of the posts on this thread). But back to the OPs question. Where did you read "when installing press-fit cups into a carbon shell one should do so dry"? Where have you heard " grease is not a good idea since it may soften carbon"? On the internet? I have a suggestion, why don't you contact the manufacturer of the frame and/or the bottom bracket and see what they recommend. It seems they have more at stake then anyone on this forum; i.e., they would like you to have a good experience and recommend/come back and buy their components again. Just saying. Let us know what the manufacturers say. Frankly, it doesn't sound like FAM responded as if they believe low temp galvanic corrosion between Ti and aluminum ever happens. From that view, any paste is "fine". But it does happen.